David Lee, 55, is a business investor. He is also one of the co-founders of CoalitionEdu, a group formed this March that hopes to preserve the prestige of an exam that serves as a ladder for immigrants to better education. Eight of New York City’s prestigious public high schools, including Stuyvesant in Manhattan, Bronx Science, and Brooklyn Tech, use an exam as the sole criterion for admission. The test has been a source of controversy in recent years as the percentage of black and Hispanic students in the schools decreased over time while the percentage of Asians increased. Last year, a little over half of the student populations in the eight specialized high schools’ were Asian, according to a City Council report. Blacks and Hispanics were offered only 12 percent of the seats at the schools. Currently two bills, one in the state and one in the city, that would add more criteria to the specialized admissions process are pending review next year. In an interview, Lee, who resides in Maspeth, Queens, gave his opinion on what the test means to Asian immigrant communities and why he opposes the two bills. Epoch Times: Could you talk more about why this exam is so popular in Asian communities? David Lee: You take the test, you do well on the test and get in. You don’t have to get your parent to go and schmooze a principal, or extra-curricular activities and all that kind of stuff. It’s very simple and that’s why it appeals to immigrants. Epoch Times: What year did you get into Brooklyn Tech yourself and what was it like? Mr. Lee: 1974. I would have to say it is a more rigorous school. There’s less fooling around. Because if you fool around, you’ll fail. And if you fail, you’ll be asked to leave, more or less. There’s not much nurturing going on in these schools either. You’re on your own. Epoch Times: What’s wrong with adding more criteria to specialized high schools’ admissions? Mr. Lee: You have to give credit to the test. It is a good indication of how well you’ll do at the schools. An A in one school is different from another. So we find that objectionable. You might find a straight A student in a poorly performing school and when you put that kid in the specialized school, he may not do as well. The more important thing is that the state bill does not restrict the criteria to just grades and attendance. The wording just makes it an open book. In other words, they can add anything they want at any point. And then it goes back to the mayor and gives the power to the mayor. The mayor changes every four years, so you can’t plan. Epoch Times: What kind of criteria do you fear will be introduced? Mr. Lee: Things like interviews, essays. One argument says, well, colleges use interviews and essays. But the point is, that when they started that, back in the early 1900s, it was actually to keep people out, not keep people in. Colleges wanted to have a certain type of person in there. They didn’t like to have many Jewish students in their schools back then. So they would give them a low score, maybe for poor interview skills. And that’s very subjective. So that’s what we fear. 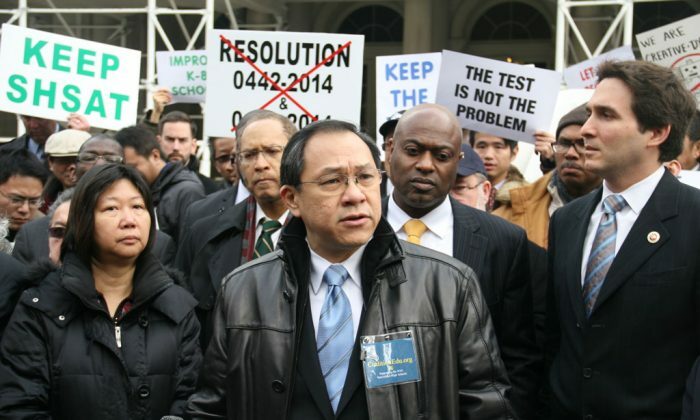 Epoch Times: Does the city bill have the same problem? Mr. Lee: All the city bill does is say that the city supports the state bill. It gives the vote of confidence to the state bill. Epoch Times: Why are Asians achieving more and becoming the majority in these specialized high schools? Mr. Lee: It’s a competition. You see how many times you can get an A. It’s a competition. If you wanted to do well in football or baseball, you’d go to a football camp or baseball camp. These parents want to send their children to math camp. And test prep, again, they’re saving their money, they’re scrimping and saving their money.